The improvement in the managing of commercial teams implies new and more demanding challenges for both manufacturers and pharmaceutical laboratories. This requires balancing the necessary resources according to each channel (pharmacy, para-pharmacy…) as well as using the most appropriate technology that allows us to achieve the best results. In the point of sales management area, we find new technological solutions that are already a reality and that improve teams’ performances day by day. We are talking about image recognition. What does image recognition consist of? From an image bank of the products, this technology analyzes the pictures and identifies patters through artificial intelligence algorithms, which categorize shapes and colors. These machine learning algorithms learn to identify the information inside the pictures, reliably managing great volumes of data and offering many competitive advantages. If we focus on data collection activities in the point of sales (audit), image recognition allows us to translate this information into key data and indicators, just from the pictures taken. That is, by taking pictures, the commercial agent doesn’t have to manually introduce the taken data, which allows him to avoid mistakes and to save time, which he can use to perform tasks with more added value. The commercial takes pictures of the products, either their own brand’s or the competition’s brand, from the pharmacy’s shelves. He can do it with his mobile device (a tablet or smartphone). At that same moment, from the store, the pictures are sent to the cloud, where they are immediately and automatically analyzed, and results are generated. – Saving time and resources both when auditing the shelves and when collecting market information. – Optimizing the commercial process, as we collect more information in less time, in a more reliable way and with identic criteria for everybody. – Obtaining information with a more homogeneous vision and without mistakes on what happens in pharmacies, which facilitates negotiations with this fresh information. 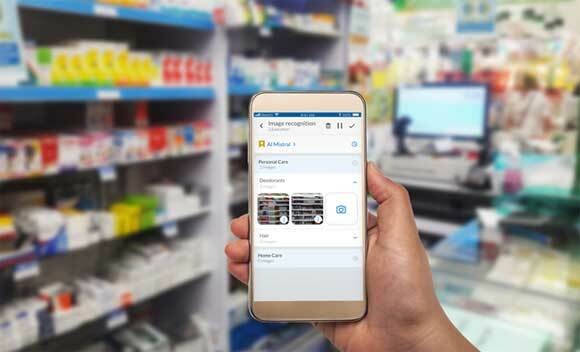 – Spending more time with added value tasks such as improving our positioning in the pharmacy or identifying new opportunities, or the possibility that an agent combines the task of taking an order while collecting valuable data from the shelves. We started this article talking about an improvement in commercial teams’ productivity, and that is the focus of our strategy, the continuous improvement of commercial processes. Our value proposal for the pharmaceutical industry includes, as an option, image recognition incorporated into our CRM, offering a 360-degree vision on the organization. Image recognition gives the commercial agent more time to perform immediate corrective actions in store; they will be able to measure their visibility on the shelves in a quick way, while substituting routine tasks that they sometimes do not have time to carry out. The inputs will arrive immediately to trade marketing and sales departments, giving them time to notice actions from the competition or to identify new opportunities, up-selling and cross-selling strategies, etc. things that they may notice too late working in another way. In the end, we’ll have more knowledge, quicker and more precise, facilitating the coordination of different teams, achieving a differentiating competitive advantage.